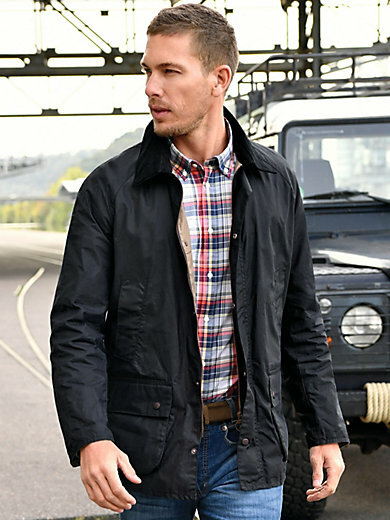 Waxed jacket by BARBOUR: this windproof and waterproof jacket’s design draws on the success story of the legendary BARBOUR classic. Features include corduroy trim at the collar and the spacious bellow pockets that lend the lightweight outdoor jacket its distinctive look. Zip, press stud panel, side slits with press stud fastenings and numerous pockets on the inside and out. Outer material in 100% cotton. Lining in 100% cotton featuring BARBOUR tartan checks. Length approx. 72cm/29ins. We recommend you do not wash the waxed jacket – wipe it down with a damp cloth instead. Sizes: 48/50 (M), 52 (L), 54 (XL), 56 (XXL).